Want to quickly see how the open-source software XennoBB works? You'll find a free and updated demo installation of XennoBB here. We are currently updating the XennoBB demo. Please check back shortly. There will be a new version up soon. XennoBB is a free open source forum software developed using PHP as a programming language and a MySQL database. It was initially released under the GPL license, but due to numerous complaints regarding the fact that it did not respect its terms, the project was finally cancelled in September 2007. There is no download available for this forum software, and you cannot create your own XennoBB demo. 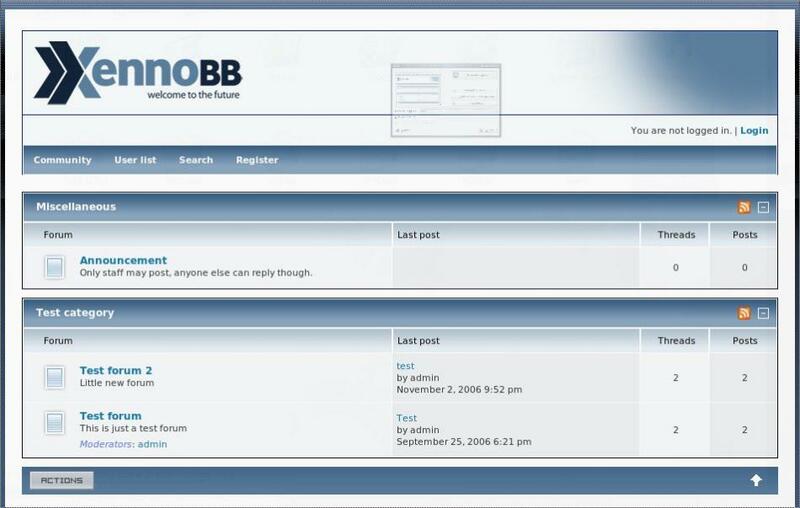 However, you can have a look at the screenshot below to see how a XennoBB demo site used to look like. The last version released was 2.3.3 and became available on September 9, 2006.